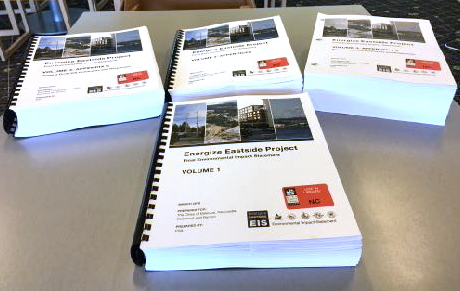 The Final Environmental Impact Statement (FEIS) for the Energize Eastside project was released March 1, 2018. This large document was prepared by consultants with input from PSE. It describes the anticipated environmental impacts of the project and possible mitigations. The FEIS documents can be downloaded from the Energize Eastside EIS website, or using the links below. If you read any part of it and would like to share your insights with us, please send us a note at info@cense.org. For more information see CENSE’s press release about the Final EIS here. Although the public cannot comment directly on the FEIS, the cities of Bellevue, Newcastle, and Renton are accepting comments on PSE’s application to build the transmission line. CENSE can help you comment with our Permit Application Comment Guide. PSE has not applied for permits to build in Redmond yet, but that will occur in a few months. These are large files and could take awhile to download. Alternatively you can download individual sections below. You can access interactive maps that show water resources, parks and recreation facilities and trees potentially impacted by PSE’s Proposed Alignment, as well as existing and proposed pole locations, by clicking on the links provided below. The first two maps are similar to the maps included in the Final EIS, Section 4.3.5 (Water Resources) and Section 4.6.5 (Recreation). The three maps give you the ability to zoom in to locations along the project corridor and to select key features. Use your mouse to click on a segment or recreation facility to bring up a pop-up window that provides additional information.